As part of a company’s leadership development efforts, a leader may be expected to make significant shifts in their leadership approach. These shifts are often in the emotional intelligence arena, for example, communication, relationship building, and empathy. And it is in these interpersonal domains that resistance to change may be particularly strong. We all know that change is difficult. Human beings are not wired for change – we are wired for homeostasis. Think about what happens with so many New Year’s resolutions: we start with a desire to change a deeply imbedded habit or behavior, then find ourselves reverting to old, familiar ways. On an unconscious level, change is perceived as a threat, as a danger. Our internal systems and defense mechanisms rise to protect ourselves, becoming barriers to achieving our conscious, desired goals. As you can see in Figure 1, genuine change begins with self-awareness. Self awareness (insight) leads to identifying and practicing new behaviors (action), which is then followed by considering the impact of those actions (reflection), which then leads to more awareness. This is where 360° feedback comes in. The underlying premise of the 360° feedback mechanism is that by providing someone with compelling, reliable, and credible feedback, they are more likely to believe it, accept it, and act on it. In leadership development, it is used as a way of grabbing the leader’s attention, thus increasing their self-awareness, the first step in the process of change. Attention to this feedback increases the leader’s motivation to do things differently — to intentionally alter their behavior and change built-in ways of operating. 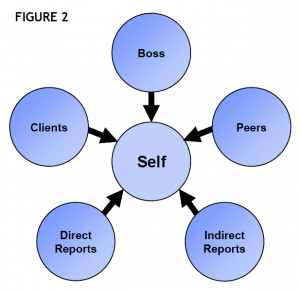 Here’s how the 360° process works: Input on someone’s performance is gathered from that individual’s stakeholders — boss, peers, clients, direct reports, and others. (See Figure 2). These results are compiled into a composite report, assessing the perceived impact that the person’s leadership has on each of the rater groups. This report is then used to help the leader develop action plans for behavioral change. In the more than two decades that the 360° feedback process has been around, there have been many lessons generated about what to do and what not to do. Below are some commonly expressed reactions to situations where the 360° process has been used inappropriately, incorrectly, or ineffectively, along with suggested ways to prevent these problems. One of the worst mistakes with 360° feedback is using the data to confirm suspicions about performance issues and to come to a termination conclusion. 360° feedback should never be used for this purpose. When people suspect that it is being used that way, it inevitably results in lack of candor by the raters and lack of trust and commitment by those being rated. 360° feedback is best used solely for developmental purposes. When the goal is to expand the leader’s insight about his or her impact on others, peers and direct reports are more likely to provide honest and meaningful feedback. Ideally, the results report should be provided to the leader recipient only; the boss should not get a copy. However, the leader should be expected to share highlights with the boss once those results are understood and processed. Instruments vary in terms of their clarity and complexity. They also vary in terms of reliability and validity. Leaders will not pay attention to the results if they do not believe in the instrument’s value. An instrument’s foundation — the research that backs up the model and its underlying psychometrics — are the basis of credibility. Data-oriented leaders, in particular, may want to see some proof of the instrument’s credibility. If raters don’t feel comfortable providing ratings or comments that truly reflect their experience, the leader will receive vague and uncompelling results. Orienting the raters and educating them about the process can help them feel comfortable in providing candid feedback. The raters should understand that full confidentiality is protected (and make sure that it is). Also, make sure that the raters know that the recipient is the only one who will see the results, and that their input is not going to be factored into a merit increase or other personnel-related decisions. 360° feedback is often rolled out as a human resources initiative. The participants may not have been involved prior to the start of the process. There are often many questions that go unanswered regarding “what it is all about”, “why me”, “why now”, “how raters got selected” and other process unknowns. If insight and behavioral change are really the desired outcomes, the participant needs to be involved from the outset. The process should begin with setting the context for the 360° process. This is a great opportunity for the organization tocommunicate its commitment to investing in the development of valued leaders. One strategy is to conduct a kick-off meeting where participants are oriented to the steps that will be followed and receive guidance in selecting raters. They should be introduced to the 360° instrument so they understand what dimensions will be covered. It is frequently worthwhile to have senior managers go first as 360° recipients. This group can be the role model for how they incorporate feedback into their own developmental attention and create conversations to share feedback. It also sends the message that the organization is serious about its interest in supporting a development and feedback-rich culture. Instruments often provide an opportunity for open-ended comments. These can be very helpful for the leader in understanding the various perspectives that underlie the ratings. The comments are typically reported exactly as they were submitted, and they can sometimes be quite harsh. It is important to have an objective person, with expertise in use of the assessment tool, work with the leader in understanding the data. The recipient is often too close to the data to see and hear the key messages. The feedback facilitator (internal or external person) can help shed light on the competencies and measures and ask questions to help the leader interpret the themes and development implications. Feedback facilitators/coaches also invite focused attention on the identified strengths. As current leadership books stress, much of leadership success comes from relying on one’s strengths as opposed to improving weaknesses. A 360° report provides powerful confirmation of the leader’s strengths, feedback the leader may not often obtain. Without a facilitator, most recipients will have a natural tendency to overlook the identified strengths. If the report is dropped in the leader’s lap with the expectation that change will happen without any further support or follow up, there will be disappointment on everyone’s part. 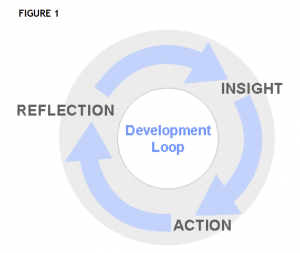 Development cannot happen without concerted and consistent practice and reflection. It would be like going to the gym and having a body assessment completed, with the hope that just the assessment without any exercise practice will result in some physical changes. Accepting the data is the first step; prioritizing and identifying the top one or two items to work on is the next step. Support should be provided to the leader in the crafting and carrying out of a development plan. Leaders should be held accountable for taking their development plans seriously and making progress. This accountability piece can be the linkage to performance appraisals – their development efforts can be monitored and supported through the performance management system. A well-planned and implemented 360° process can have a powerful impact on leadership effectiveness. A poorly planned and executed 360° feedback process, on the other hand, can result in demoralized and mistrustful participants, and a great deal of wasted time and money on the part of the organization. Unless the organization is ready to incorporate the ingredients for success, they are better off not doing it at all. Carol Salloway is the co-founder and partner at Performa Consulting Group. She may be reached at carolsalloway@performagroup.com.